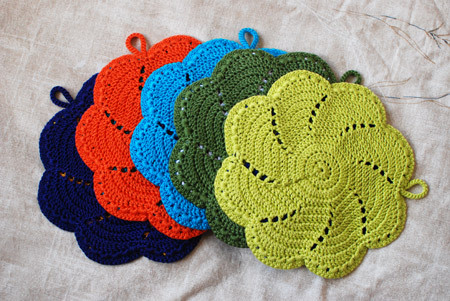 I have received many inquiries regarding the pattern for these potholders. You can purchase the original pattern on Etsy. My modifications are detailed here and here. I did not keep careful notes about my modifications. Also, the original pattern is copyrighted, so I do not have the liberty to reveal the construction details. I came up with my modifications by knitting the original pattern as written, and then tweaking it to make it fit for my yarn and gauge; it was an organic process. I think there is much to learn about how yarns and stitches behave by this kind of trial and error, and I encourage everyone to try! 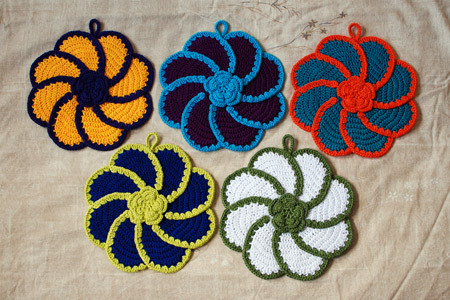 Despite a gazillion other things going on, I’m so happy I persevered and finished these for the 2011 Potholder Swap (on Ravelry, on Flickr): they make me so happy! I’m also really pleased that I was able to crochet a shape other than a square, which was one of my goals for this year’s swap. Compared to my 2009 and 2010 potholders, I think these are the most vintage-looking ones to date, but I hope their bright colors make them at home even in a modern kitchen. I even like the textured, though solidly-colored, backs! 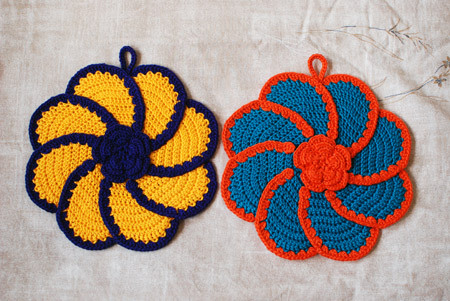 Pattern: Pinwheel Rose potholders. My modifications are detailed here and here. As usual, I blocked them with some steam from the iron, nothing more. Yarn: Tahki Cotton Classic, 100% mercerized cotton. I wasn’t as good this year at keeping track of the different colorways I used as I’ve been in the past. Some were half skeins from the stash, and others were freshly purchased. I know I needed just about a full skein of yarn to crochet the back, the rose in the middle, and the decorative ruffles. I suppose this we would call the “contrast color.” Obviously less yarn for the front (main color). Crochet hook: size C (2.5 mm) from this set , which is still my favorite. The one thing that wasn’t particularly thrilling was the realization that two of the potholders came out the exact colors of two NFL teams: the Minnesota Vikings and the Miami Dolphins. But for this I take absolutely no credit: I had my husband pair up the colors one late evening when I had simply exhausted all my energy for the day. Being a huge NFL fan, I think it was only natural that these color pairings emerged. I hope the NFL potholders will be loved all the same ;). My favorite two are the purple with blue, and blue with chartreuse. So, so pretty. You did a beautiful job with them! As one who’s married to a guy who went to “Big Ten” schools for undergrad and grad school, I didn’t think Vikings with the potholder on the left…I thought instead of that evil, evil school in Ann Arbor, University of Michigan! I didn’t even know what Big Ten meant before 5 years ago, but that’s a different story. ps…they’re amazing, I wish I had gotten myself in motion just to have the chance of getting one of these in the swap! Next year! Kathy, these are GORGEOUS!! You should be very proud of your hard work and determination. These are gorgeous. I would only use these for decoration. They make me happy to! The “Vikings” one is my favorite color combination but they are all so pretty! Ooohhhhh these are Gorgeous!! Great job! Another example of your beautiful work! They are lovely. Fabulous potholders! And I think it might be hard NOT to pair up colors from some team in some sport somewhere. Don’t stress. Your recipients won’t care one whit. Nice job on these potholders. Although the blue/orange combo reminds me of the New York Mets baseball team! These are glorious! I love them to pieces! Totally awesome! Love them and the colors are terrific! You’re amazing! 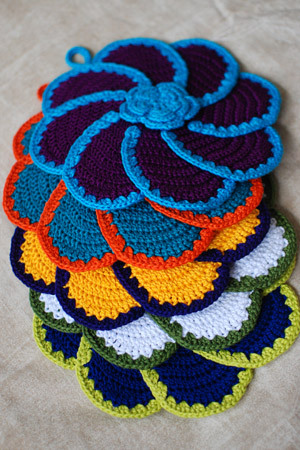 i wish i could crochet better, so i could make these potholders! they’re lovely! You also have the Jets covered in the green and white one. They are all lovely, though. Well done! When using bright, pure colors like these (which I love), I think it’s unavoidable that team colors will happen. Lovely potholders. I may have to try them someday. Those are simply beautiful!! You’ve done a wonderful job! Those are just gorgeous! Wow! And so neat. Your handiwork is so clean. I love it! I love these so much! The colors are so crisp and modern. Great looking potholders. I think the colours look modern not retro… but then maybe the old colours are back!! !